There's trouble ahead for banks, Wall Street and upscale suburbs. Not to mention President Donald Trump. Elections have consequences. One of the biggest is that firebrand Congresswoman Maxine Waters, D-Calif., is the new head of the powerful House Financial Services Committee. That gives her power over banking, the securities and insurance industries and the Department of Housing and Urban Development. Egging her on to pursue a far-left agenda will be new committee members like self-styled socialist Alexandria Ocasio-Cortez, D-N.Y., expletive-shouting Rashida Tlaib, D-Mich., Elizabeth Warren acolyte Katie Porter, D-Calif., and progressive Ayanna Pressley, D-Mass. Waters has it in for banks. She blames them for the two million loans to low-income borrowers that went sour more than a decade ago, causing widespread foreclosures and the 2008 financial meltdown. "I have not forgotten," she warned bankers as she prepared for her powerful new role, "you foreclosed on our houses ... had us sign on the line for junk and for mess that we could not afford." She added, "I'm going to do to you what you did to us." That's Waters' distorted interpretation of what happened. In fact, throughout the 1980s and 1990s, Congress used the Community Reinvestment Act and anti-discrimination laws to coerce banks into making mortgage loans to low-income borrowers with lousy credit ratings and in some cases, no down payment. The idea was to promote minority home ownership. But when the borrowers couldn't pay, lawmakers turned on the banks, accusing them of predatory lending. Waters is poised to repeat that failed experiment. Of course, the House alone can't pass a law that would trigger a disastrous repeat of the subprime mortgage crisis. But Waters is already bragging about plans to grill banking executives. Look for bank stocks, finally rallying after their limp close in 2018, to tremble when she does. Waters is also gunning for Trump administration Housing and Urban Development head Dr. Ben Carson. She has previously threatened that when Carson came before the committee, she intended to "take his a-- apart." She's irate that he scrapped a program started by President Obama to strong-arm affluent suburbs into building affordable housing and offering low-income job opportunities smack in the middle of their fanciest neighborhoods. Obama's HUD rule said that if low-income minorities want to move into a town but can't afford it, the town must provide "adequate support to make their choice viable." In short, mandatory diversity. Carson's own position is that as long as a millionaire of any race can buy a home in any expensive suburb, housing discrimination because of skin color is no longer a barrier. The federal government has done its job. Carson has no interest in what he disparages as "failed socialist experiments." Corporate America is also in Waters' crosshairs. 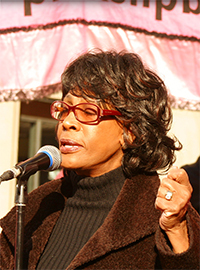 Announcing her priorities, Waters said that minorities and women are unfairly locked out of executive positions. She's taking aim not only at financial services but also the technology industry. On a recent visit to Silicon Valley, where she complained about how few black employees were being hired, she said: "I'm not urging. I'm not encouraging. I'm about to hit some people across the head with a hammer." Waters announced this week that the Committee will form a new subcommittee on diversity and inclusion. Committee members Carolyn Maloney, D-N.Y., and Gregory Meeks, D-N.Y., are pushing for legislation forcing all public companies to annually disclose the racial, ethnic and gender composition of their boards. That's the first step toward quotas. In addition to the Committee's anti-capitalist agenda, its members are hungry for dirt on President Trump. For 18 months, Waters has been insisting that it is "time to go after him," and that "impeachment is about whatever the Congress says it is." She'll make her Committee a tool to that end, demanding documents from Deutsche Bank, a major lender to the Trump Organization. She tried it in 2017 but lacked the power. Now Waters is in charge. Expect two years of inflammatory charges against banks, corporate executives getting the third degree in front of the Committee and reckless talk about impeaching the president. A circus.